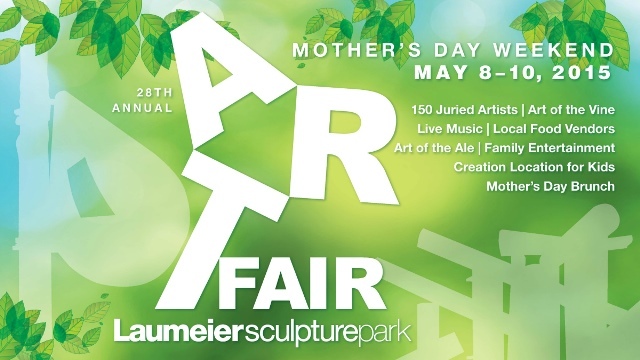 28th Annual Art Fair at Laumeier: More than 15,000 patrons attend this annual three-day event on Mother’s Day weekend, featuring local food vendors, a wine garden, live music and 150 juried artists exhibiting work in ten categories. Media categories include ceramics, fiber/textiles, glass, jewelry, mixed media 2D, painting, photography/digital, printmaking/drawing, sculpture and wood. Art of the Vine is a special wine tasting event which kicks off this annual event on May 8th from 6-9pm. On Saturday from 5-9pm, enjoy Art of the Ale, a special beer tasting and Q&A presented by Schlafly. On Sunday morning, there will be a special Mother’s Day Brunch before the fair. Advanced reservations are required. Enjoy a great weekend of art in one of the first and largest dedicated sculpture parks in the country. The Who Hits 50 Tour: Tho Who, one of the most influential rock bands of the 20th century, is celebrating their final North American tour and they are stopping in St. Louis. The band has about sixty concerts and tour dates mapped out to celebrate their 50th anniversary. With so many great hits including: Baba O’Riley, Pinball Wizard, Behind Blue Eyes, My Generation, Won’t Get Fooled Again, I Can’t Explain, Magic Bus, The Seeker and so many more, this will be one epic show. Tickets start at $36.50. Food Truck Friday: The once a month foodie event where you have all of your favorite food trucks in one place. Throw in some live music and friends and it’s a great happy hour kick-off to a Friday night. With 20+ trucks including dessert and drink trucks (Urban Chestnut), or you can BYOB, it’s a great event to meet people and enjoy the community atmosphere. This month’s FTF kicks off with Letter To Memphis playing from 4-7:30pm. Don’t forget your lawn chairs! Miles Over Melanoma: Our M.O.M. Inc puts together this yearly event with the goal of educating people on the importance of protecting their skin and finding a cure for melanoma. Their message includes wearing sunscreen at all times in the sun. Thanks to the generosity of supporters, Our M.O.M., Inc. has donated $210,000 to aid research for an effective treatment and hopefully a cure of melanoma. This is a 4 mile walk/run that includes t-shirt and lunch. The timed run is at 10am, and the walk is at 11am. There will also be educational booths, a dermatologist available to answer questions, music, children’s activities, and more. Walk-ups are welcome but not guaranteed lunch or a shirt. Registration is: Adults/$30; Kids/$15. Girls on the Run: This 5K or 1-mile fun run is a race benefiting Girls on the Run STL, a youth development program for girls ages 3 to 8 which works to inspire and motivate girls, encourage lifelong health and fitness, and build confidence through accomplishment. Medals will be awarded to all finishers. Awards for top three finishers (male and female) in each age division. Registration is: $30 through May 8th or $20 for children under 12 and $35 on race day. Indie Book Fair: Mark Pannebecker, a self-published indie book writer, has launched this first annual event to help other indie authors and spread the word about local writers and great books. In his fair, he has included St. Louis authors such as April Floyd, the author of Unique, Robert Holt the author of The Vegetarian Werewolf, and many more with over 55 book titles, ranging from children’s to young adults, adult fiction and nonfiction, self-help, inspirational, short story anthologies, to poetry. Visit the Book Fair then stroll the bustling street of Cherokee and sample the food, drinks, and the unique merchandise available in the many small, locally owned businesses. Spring Fling in the City: Local vendors selling vintage clothing, vintage accessories and vintage home decor, as well as vintage-inspired handmade items. Enjoy live music from local bands Ruth Acuff and Letter to Memphis, dancing from local social club Lindy Hop St. Louis, food from local eateries La Mancha Coffeehouse, Crown Candy Kitchen, Completely Sauced, Vincent Van Doughnut, STL Kettle CORN and The Southerner StL and 4 Hands Brewing Company will be setting up a beer tent to keep the good vibes flowing. Looking for that sweet tooth to do some good? Get tickets to a new activity this year: a bake walk sponsored by local bakery Whisk: a Sustainable Bakeshop! All proceeds will benefit two local organizations: CAMP and Building Futures. Mother’s Day Out: This is the weekend to celebrate mom and thank her for all she does throughout the year. And what better place to celebrate that at the family farm! While you are here, treat mom to a home-cooked meal at our Country Restaurant and stick around to enjoy live entertainment at our outdoor festival. Free wagon rides. We will have plenty to keep the kids entertained including pony rides, children’s play area, petting farm, carnival rides, and inflatable. Strawberry treats in the bakery, custard shop and restaurant. Ed Sheeran: The amazingly talented English singer/songwriter will be making a stop in St. Louis on his latest tour promoting his newest album, X, featuring Thinking Out Loud and Sing ft Pharrell, among other great songs. Pretty much everything he does is amazing. There are few tickets left so get them while you can. Summer of 69: No Apostrophe: Comedy couple Nick Offerman & Megan Mullally, also known as Ron Swanson and his crazy ex wife Tammy, are yanking the britches right off of their marriage, exposing the salacious details of their fiery union for all the world to enjoy, featuring songs, funny talking, heavy ribaldry, light petting and an astonishing final act of completion. This is one comedy show you will not want to miss. Tickets are $36.50. Rain: A Tribute to The Beatles: A live multi-media spectacular that takes you on a musical journey through the life and times of the world’s most celebrated band. Featuring new songs and high definition imagery, you will enjoy all of the songs you know and love – from the vast anthology of Beatles classics such as “I Want To Hold Your Hand,” “Hard Day’s Night,” “Sgt. Pepper’s Lonely Hearts Club Band,” “Let It Be,” “Come Together,” and “Hey Jude.” Don’t miss the Broadway smash that’s taking the world by storm. Tickets start at $49.50.